The Greater Vancouver Regional District, with a population of 1.5 million includes the cities of Vancouver, New Westminster, Surrey, Port Coquitlam, Port Moody, Richmond, White Rock, Langley, North Vancouver, the districts of Burnaby, Coquitlam, Delta, North Vancouver and West Vancouver. This area is densely populated with half of B.C. 's residents living on the lower Mainland. Situated on a peninsula between Burrard Inlet and the Fraser River with the Pacific Ocean (Georgia Strait) to the west , Vancouver is the country's third largest city. The climate is mild year-round with warm summer days and cool and rainy winters. 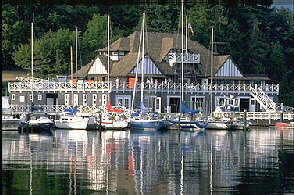 First established as a shantytown around the Burrard Inlet Sawmill the city burned to the ground in 1862. It was rebuilt with brick and stone buildings and expanded rapidly in the years to come. UBC is in Point Grey, on a finger of land that juts out into the Straits of Georgia. 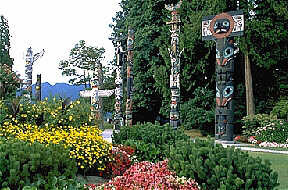 It is famous for its Museum of Anthropology, Botanical Gardens and the Nitobe Memorial Gardens. Over 34,000 students attend classes here every year. This is one of the continent's largest and most scenic parks. It is located at the foot West Georgia Street between English Bay and Burrard Inlet. Visitors may wish to visit the Aquarium, view the abundant birdlife here or stroll along one of the many paths which meander through this beautiful park. Journey into the stars, enjoy a laser show or see a concert at 1100 Chestnut Street (Vanier Park). View over 500 species of plants, trees and shrubs here at Little Mountain, the city's highest point. It is located at 33rd Avenue and Cambie Street. North America's second largest Chinese community is located between Carrall Street and Gore Avenue and offers the shopping for jade, ivory, bamboo, rattan, brassware, silk, as well as fresh fruits, vegetables and ginseng. When in Chinatown be sure to visit Dr. Sun Yat-Sen Classical Chinese Gardens, at 578 Carrall Street, the first authentic classical Chinese garden built outside of China, a 5-million dollar Ming Dynasty replica. Named after a pioneer tavern keeper, named "Gassy Jack" Deighton, Gastown incorporates the streets of Carrall, Powell, Water and Alexander which meet at Maple Tree Square. In 1971 it was designated as a Heritage area.